This looks like a perfect solution for video projects I’m building in Processing (with the awesomely cool JMyron) and Flash/ActionScript. The good news is, thanks to USB Video Class support, you’re assured the Optia will work without drivers on Windows XP SP2 and later, and should also work on Linux and even Mac OS X. Now, the driverless part: the Optia supports the USB Video Class, so like other class-compliant USB devices (QWERTY keyboards, mice, joysticks, USB audio interfaces, USB MIDI controllers, etc. ), you should be able to plug the thing in and have it work without installing a single driver — if your operating system supports the class specification, that is. In the case of devices like mice and audio interfaces, Windows, Mac, and Linux all support pretty much everything. The USB Video Class is a newer spec, though, so Creative Labs lists only Windows XP and Vista support, starting with XP SP2. Enough of the specs, though. 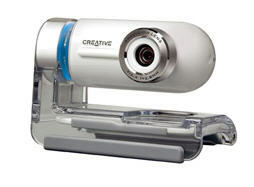 Can you use this camera and other class-compliant cameras outside Windows? Strangely enough, the answer comes from a GNOME blogger named Ronald S. Bultje trying to install Linux on a MacBook Pro, using its internal iSight. Surprise, surprise: the iSight appears itself to be build on the UVC spec, and is sorta kinda supported on Linux as a result. On the Apple lists, someone has luck with another UVC webcam. It looks to me from other discussions on the Apple lists that, if UVC was implemented at all, it happened some time around OS X 10.4. There’s really only one way to find out for sure, of course, which is to use the time-honored and highly technical test of getting one of these, plugging it in, and seeing if it works. But I’m hopeful. I’m going to pick one up, so I’ll let you know what happens. It’s about time Mac users in particular abandon the tyranny of the external iSight camera and realize they have choices in hardware.